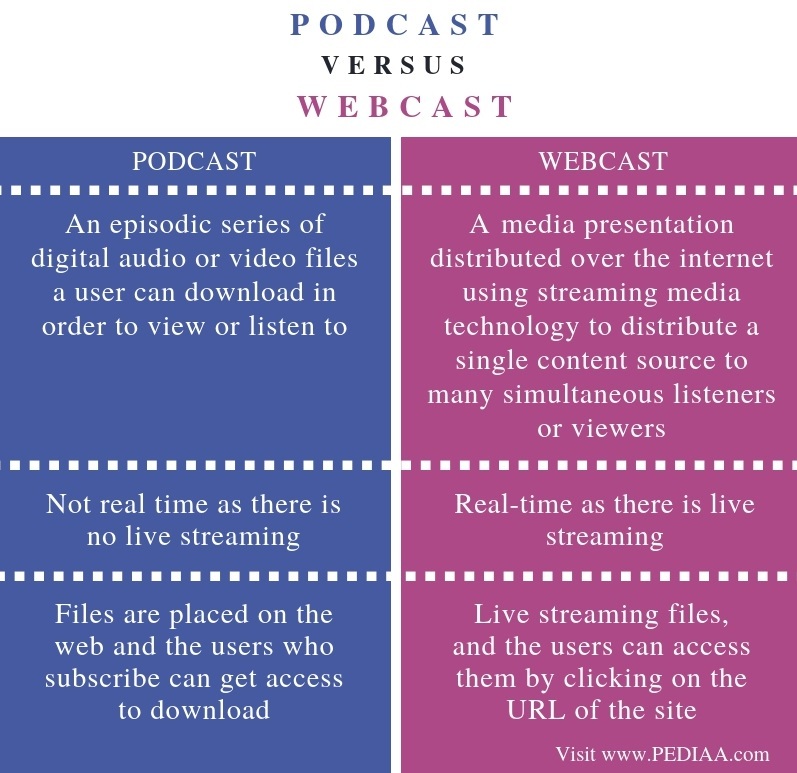 The main difference between podcast and webcast is live streaming. There is no live streaming in a podcast while there is live streaming in a webcast. A podcast is a digital media consisting of a series of episodes that allows the users to download it via internet while webcast is a media presentation that can be broadcasted or presented to many users over the internet. A podcast is an audio or video show which consists of a series of episodes. The users can download them from the internet and listen to it using a computer or an MP3 player. Podcasts cover various aspects such as humour, poetry, studies, gossip, interviews and many more. A person who has a computer and a good internet connection can create and distribute podcasts. Usually, these creators upload that content to a website so, the users can watch/listen or download them. The podcast generator maintains lists of files on a server as a web feed. The user can access the web feed and check the update. Furthermore, he can download the required files to the device using software such as podcatcher. It is also possible to automatically download them through web syndication to user’s machines, mobile device or any other portable device. The users can view them offline too. A webcast is a media presentation that is distributed to many listeners or viewers. It can be live and created on demand. Webcasting process involves broadcasting video live through the internet. It allows the webcaster and the viewers to communicate with each other in real time. Thus, this technology is widely used in organizations as it helps to directly communicate with their customers and to discuss their issues. Therefore, it is a good marketing strategy to promote their companies. There are various webcasting services available online. There are educational webcasts, product, and services promoting webcasts, etc. Overall, webcasting is a cost-effective method to increase the number of users and create a positive user experience. A podcast is an episodic series of digital audio or video files a user can download in order to view or listen to. A webcast, on the other hand, is a media presentation distributed over the internet using streaming media technology to distribute a single content source to many simultaneous listeners or viewers. These definitions explain the fundamental difference between podcast and webcast. A podcast is not real time. In other words, there is no live streaming. On the other hand, a webcast is real-time as there is live streaming. This is the main difference between podcast and webcast. Accessing is a yet another difference between podcast and webcast. 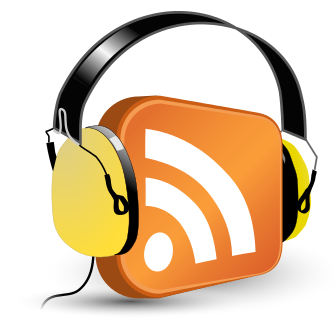 Podcast files are placed on the web and the users who subscribe can get access to download. 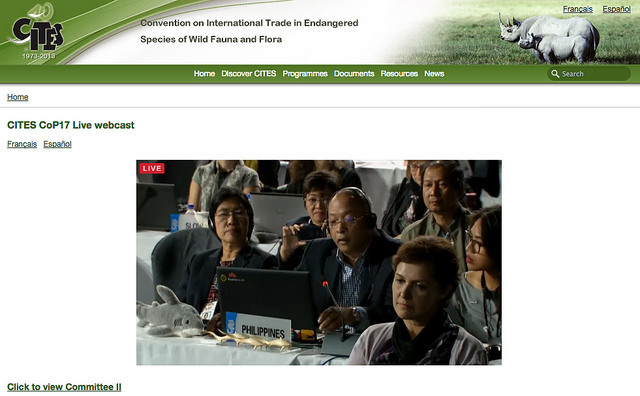 Webcast files are live streaming files, and the users can access them by clicking on the URL of the site. The main difference between podcast and webcast is that there is no live streaming in a podcast while there is live streaming in a webcast. If someone wants to distribute content such as tutorials, scripted shows, etc. the best choice is podcasts. If it is necessary to distribute the content in real time, then the best choice is webcast. 1. “Podcast.” Wikipedia, Wikimedia Foundation, 9 Jan. 2019, Available here. 2. Naughton, Pete. “What Is a Podcast and Where Can I Find the Best Ones to Listen to?” The Telegraph, Telegraph Media Group, 28 Apr. 2016, Available here. 3. “What Is a Podcast? – Definition from Techopedia.” Techopedia.com, Available here. 4. “Webcast.” Wikipedia, Wikimedia Foundation, 22 Dec. 2018, Available here. 5. “What Is Webcasting? What Is a Webcast – Definition from Techopedia.” Techopedia.com, Available here. 6. “What Is Webcast? – Definition from WhatIs.com.” SearchNetworking, Available here. 7. “What Is Webcasting? | Informatics Inc.” All Things Internet | Informatics Inc., Available here.